Israeli novelist Assaf Gavron's recent book Hydromania has yet to appear in English, as far as I can tell, but I'd love to read it when it does. 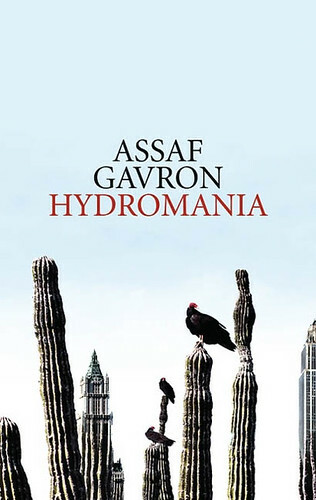 [Image: The German cover of Hydromania by Assaf Gavron]. The constantly thirsty people drink "Ohiya Water" or "Gobogobo Water," which they must buy from the companies. The private storage of water is not permitted and the ban is strictly enforced by means of an all-seeing surveillance system. Israeli territory has been reduced to a narrow strip bordering the Mediterranean Sea and to two major cities, one of which, Tiberias, is destroyed through Palestinian military action in the course of the novel. Israel is thus left with only its capital, Caesarea, and some surrounding districts. Countless Israelis are reduced to refugee status: the poorer living in primitive conditions aboard wrecked destroyers off the coast, whilst the better-off inhabit floating residential areas with appealing names such as "Ocean 8." The book's speculative fictionalization of future water politics won the Geffen Prize in 2009, and has already been published in Hebrew and German, with a Dutch translation forthcoming next year. Anyone out there read it yet? Is it good? Dude, it's like that movie Solar Babies. it _is_ good. i've read it in german. assaf gavron is a very promising author, with somehow uncommon but good ideas. i read also 'croc attack', which is a great book, too. I'd second that - Croc attack is fantastic, as is Hydromania. Both describe a alternate Israeli reality (although Croc is obviously not science fiction, more of an *even more* extreme version of turn of the century Israel), something which is pretty rare afaik in Israeli Literature. Gavron is a slightly dry writer - almost factual. But I tend to like that. Almost Delilo-like style. Some of the ideas in Hydromania are especially poignant - the smartphone type glasses wired into information and commercial networks for example. Thanks, Isaac and anon – I'll keep my fingers crossed that it appears in English soon. Yet another reason to love this website! Thanks for drawing my attention to this book--just ordered it (Hebrew). Thanks for the brilliant work, always great stuff on this site. visions of a future with little moisture..i've been reading the Dune series and thinking about the issue a lot, the author using water as a metaphor for oil in his ecologically-minded sci-fi epic. saw a fire hydrant running just this past week and was shocked, my brain still being in the world of the novel in which water is so scarce that every drop is precious for the everyday man. this books looks really interesting. hoping for a translation. "Thanks. English rights for Hydromania have not been sold yet - I forwarded the bldgblog post top my English-language publishers and to my agent - hopefully it will not take too long." Thanks, Shlok! The direct approach is best.